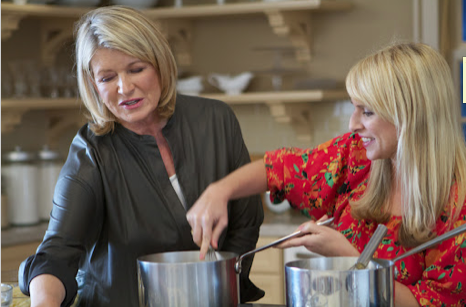 Did you Watch Episode 1 of Martha Stewart’s Cooking School? Martha Stewart shows the best way to peel hard boiled eggs. via Video: Martha Stewart’s Tip: Peeling Eggs | Watch Martha Stewart’s Cooking School Online | PBS Video. “Martha Stewart’s Cooking School” Page is Now Live on the PBS Website! “Martha Stewart’s Cooking School” now has its own page on the PBS website! There are many useful features there–you can watch full episodes (once they’ve aired), download recipes, see what techniques will be featured on future episodes (all 13 are listed already! ), and more. FOMs: You can also check on PBS.org to see when “Martha Stewart’s Cooking School” airs on PBS! Inspired by the eponymous best-selling book, Martha Stewart’s Cooking School will give home cooks a culinary master class with Martha herself. Beginning October 2012, she will demonstrate classic cooking techniques and basics. Using her signature step-by-step, how-to teaching process, Martha illustrates cooking fundamentals that everyone should know: from roasting and poaching to braising and blanching. In addition, Martha shares tips in every 30-minute episode, inspiring and educating home cooks everywhere.Be sure to check your local listings to see when the program will be airing in your area. via Martha Stewart’s Cooking School | Cooking Shows | PBS Food. Enjoy this new promo video for the upcoming (premieres next week!) “Martha Stewart’s Cooking School” on PBS. I’ve seen premiere dates of October 6th and 7th. Best to check your local listings to see when it’s on in your area! FOMs: The moment we’ve been waiting for is almost here! Martha Stewart explains the concept behind her new PBS show, premiering in October. via Video: Martha Stewart Talks About Her New PBS Show | Watch Martha Stewart’s Cooking School Online | PBS Video. Let the press coverage begin! On Wednesday of this week, Martha hosted a press event to publicize the launch of “Martha Stewart’s Cooking School” on PBS. The show premieres the weekend of October 6/7, so be sure to check your local listings and don’t miss the show! Be sure to visit Martha’s blog to see Martha’s trick for peeling garlic–without using your hands! It’s a nifty one, for sure. I was hosting a press event in our new kitchen set, celebrating the launch of my new television show, “Martha Stewart’s Cooking School,” premiering October 6 and 7 on PBS stations nationwide. Fans can access clips of the show each week, along with recipes, on PBS.org. We’ll also offer the show in full, along with recipes, on marthastewart.com within 48 hours of airing. via Hosting a Press Event for “Martha Stewart’s Cooking School” – The Martha Stewart Blog. Martha’s new TV show is only weeks away from its premiere on PBS. Martha acknowledges that she is stepping into some very large shoes at PBS. Her predecessor, Julia Child, was much-loved and very highly respected by all. In this video, Martha pays tribute to Julia. FOMs: I’m certain you are all counting down to the October 6/7 start (check your local listings) of Martha Stewart’s Cooking School, right? Can’t wait! Martha looks smashing at the PBS event I first wrote about last week. She was at the Beverly Hilton Hotel in Beverly Hills to promote her new show, “Martha Stewart’s Cooking School” on PBS. I’m certain that you read Martha’s blog daily, as do I, so you can see more photos from this event there. I’m certain that I speak for all FOMs when I say: Welcome back to television, Martha–we missed you! Posing with PBS crew members who interviewed me for video that will promote “Martha Stewart’s Cooking School,” debuting on PBS stations everywhere (check local listings) on Oct. 6th. via The Official Martha Stewart Blog – The Martha Blog.